Q: Where is Kredits headquartered? A: We have our headquarters in Salt Lake City, Utah, USA, and are establishing regional offices in India for our MFI partners in Asia and Serbia for our partners in Eastern Europe. We are looking to further expand our global presence in Central / Eastern Africa, Southeast Asia and Latin America. Q: When was Kredits established? A: Kredits was established in 1998 by Don Eggert, who began developing microfinance systems in 1998, and Nancy Schmaus, who started a pioneering microcredit program in Kazakhstan in 1997. Click here to learn more about Kredits’ history. Q: Where in the world do MFIs employ Kredits solutions? A: Our technology and business process engineering solutions have been successfully implemented in over 30 countries on 5 continents. View our global implementations map. Q: Is Kredits a commercial enterprise? A: Yes, we are a highly successful, commercial enterprise appropriately resourced and experienced to help our MFI partners attain their business objectives on a long-term, sustainable basis. We are ‘social entrepreneurs’ with a clear mission to deliver solutions that help make a difference to the world's poor. Click here for our mission statement. Q: Who do I contact to learn more about Kredits solutions and services? A: Please e-mail us at info@kredits.com or call us at +1-801-252-5282. Q: Why is the Kredits solution superior and so well recognized? A: Simply put, we deliver what we say we’re going to deliver – on-time and on-budget in accordance with our MFI partners' needs. That is why we are recognized as having an outstanding implementation record and broad technology capability with successful implementation in 30 countries across 5 continents. A key to our success is that we deliver a total, collaborative solution that includes business process optimization, implementation of our scalable and highly flexible technology, and an intuitive, comprehensive service capability for personnel training, post-implementation support services and on-going enhancements to help maintain and increase the value of the investment made by our MFI partners in our solutions. To learn more, visit our Interactive Solutions Finder. Q: What financial products does the Kredits technology support? A: Kredits technology will support your MFI business operations across known forms of microcredit, savings, micro-insurance, as well as equity and cash related financial instruments and related services. Visit our Interactive Features Map to learn more. Q: Does Kredits support centralized data management? A: Yes. Kredits technology will support standalone and centralized data management methodologies, as well as a number of hybrid solutions, each designed to perfectly meet the business needs of our MFI partners and in the specific operational environment that they provide their financial services to their clients. Q: What lending methodologies does the Kredits technology support? A: Kredits supports all known forms of individual lending, the Grameen model, modified Grameen, village banking, solidarity group lending, individual lending, credit union and SACCO-based lending methodologies. Visit our Interactive Features Map to learn more. Q: How often does Kredits release upgrades to their technology? A: We generally release upgrades to our technology on a quarterly basis. Every upgrade is fully compatible with any previous release so as to safeguard our MFI partners’ existing investment in their deployment of our technology and business process mapping solutions. This helps ensure that our MFI partners can regularly benefit from the solutions we engineer and implement specifically for any individual MFI partner without compromising the overall integrity, efficiency and regulatory compliance of their Kredits solutions. Kredits technology upgrades are simple and fast to execute, taking no more than 5 minutes to implement. We also ensure that regular updates of our personnel education services are also facilitated as and when our MFI partners require. Q: Does Kredits enable customized and configurable reporting? A: Yes. 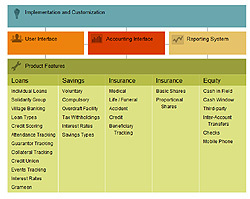 One of the most important and compelling aspects of the Kredits technology solutions is that we facilitate a highly sophisticated, yet intuitive reporting engine coupled with a built-in capacity for online data parameterization, designed to ensure that our solutions will readily support each individual MFI partner’s unique operating, financial, management and regulatory reporting requirements. This enables our MFI partners to benefit from the cross fertilization of ideas and market and regulatory knowledge. Kredits therefore facilitates an integrated capability to produce proprietary, customized reporting schedules as well as employ the use of a growing library of standard reporting schedules. Q: Do the Kredits technology solutions support Sharia law compliant lending practices? A: Yes. Several of our MFI partners already use Kredits technology to provide Sharia law compliant financial services to their clients. Q: What size MFI operations is Kredits technology designed for? A: Kredits technology solutions are designed to be highly scalable and can therefore support MFI business operations of any size. Our focus has always been to help empower MFI operations of all sizes, including green-field, early stage, NGO, regulated, and unregulated microfinance institutions. Today, our MFI partners service from just a few thousand clients to well over 300,000 clients. Many of our MFI partners are regionally and internationally recognised for their efficient business operations and ability to accelerate business growth and outreach to their clients. Q: What operating systems does the Kredits technology support? A: Our Kredits technology will work with Windows Server 2003, XP, Vista, Windows Server 2008, and Windows 7 operating systems. Q: Does the Kredits technology include integrated accounting? A:Our Kredits technology is designed to produce integrated financial accounting information without loss of any data integrity or need for data re-entry, in accordance with local and international accounting rules and with an integrated interface with virtually any third party financial accounting solution. Microfinance institutions who implement the Kredits technology can keep using their current accounting solutions, as well as adopt any of the proven solutions employed by our other MFI partners and maintain financial integrity and regulatory compliance as well as saving considerable time and resource for data entry. In addition, Kredits also generates a complete set of journal entries customized to the institution's chart of accounts. These journal entries can be prepared on a daily, weekly or monthly basis as per the MFI partner’s individual requirements. Q: What languages does the Kredits technology support? A: Kredits technology is available in 12 different languages: English, French, Khmer, Dari, Chinese, Russian, Spanish, Portuguese, Bahasa Indonesian, Albanian, and Serbo-Croatian. In addition, we have designed our technology so that we can very easily provide additional language-specific solutions for our MFI clients as and when required. Q: How long does a typical Kredits technology solutions implementation take? A: Most implementations take between three and eight weeks. Our implementation approach ensures that Kredits is fully integrated into your business operations, usually without the need for expensive parallel operations of different technologies and always with optimized work flows and business processes. We work hard and collaboratively with our MFI partners to ensure that every implementation is completed successfully, on time and on budget. To learn about our proven, 7-step implementation process, click here. Q: How can my microfinance institution benefit from the Kredits technology? A: Please contact us and we will engage in a proactive dialog to explore your needs and challenges and how our Kredits technology and business process engineering solutions can best serve your needs. Q: Does Kredits provide on-site system training? A: Yes, always. Our experienced Client Implementation Services team organizes a detailed training schedule on-site in a collaborative manner with your senior management, HQ and branch personnel and ensures that on-site training is completed during the implementation process and that there are personnel within your organization that are suitably educated and equipped to propagate those same educational and learning techniques for other new colleagues. This ensures that your investment in our technology solutions reaps the maximum return possible and that your MFI business can grow without constraint. Q: How will Kredits support our organization after implementation? A: When we engage with our MFI partners, we commit to partner with them for the long-term. It is in our MFI partners’ interests, as well as ours, that we maintain very close and proactive association with our MFI partners following implementation. Kredits experts are available 24 hours a day, every day, to provide the necessary, qualified assistance as well as consultation in response to our MFI partners’ ever- growing business requirements and technology-based support services. Our MFI partners can reach us via telephone, email, and Skype. Q: Will Kredits personnel come to our location and supervise the implementation of their system? A: Yes, always. The Kredits team is highly experienced and plans the strategic as well as operational aspects of the entire implementation process on-site for each of our MFI partners. Working in close collaboration with senior management, HQ and branch personnel, every aspect of the implementation is meticulously planned and organised with the benefit of an intimate understanding of each MFI partner’s unique set of business operating requirements. We do not leave the site of your operations until our technology is successfully implemented, rendered fully operational and working to our MFI partners’ satisfaction. Learn more about our 7-step implementation process. Q: Does Kredits offer customized technology solutions? A: Yes. We recognize and respect that every MFI partner will have their own unique set of operating requirements. Without compromising the overall integrity of our technology solutions and the sound business principles and governance framework built within them, we will often use our outstanding technology development capabilities to provide customized features, reporting schedules and technology to support new financial products and services in order to meet our MFI partners’ business requirements. Q: How successful is the Kredits team at implementing the Kredits technology solutions? A: We have a 100% success rate implementing Kredits on time and on budget. This is not easy. Our outstanding record has been accomplished through a well-researched and highly-tuned, collaborative methodology, designed to ensure optimal understanding of our MFI partners’ business operations as well as supporting technology requirements. We accomplish this by gaining intimate knowledge of our MFI partners’ business objectives and operations prior to planning and subsequently implementing the Kredits technology — thereby ensuring that each implementation befits the business operations perfectly and is completed successfully.